It has come to our attention that many people in Chatham-Kent are unaware of the products and services that we provide at Battery Boy. We’ve decided to launch a “Did you know” campaign this year in order to hopefully shed some light on some of the questions we receive daily. Battery Boy only sells BRAND NEW batteries. We carry quality name brands such as Trojan, Yuasa, Deka, Duracell and Sony. We do collect your old battery for recycling, but we only sell new ones! We stock a wide array of batteries for ALL of your battery needs. From automotive, farm, AA, AAA’s, C’s, D’s, cell phone, flashlights, key fobs, ATV, power tool, solar light, snowmobiles, watches, hearing aids, button cells, marine and more! You need it…we got it! If we don’t have it in stock, we most likely can order it in. Call us at 519-354-4127 to find out more! 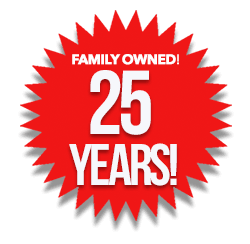 Battery Boy has been family owned and operated since 1994. 5 years ago, we became a 2nd generation family business. We are excited that in March 2019 we will celebrate our 25th anniversary serving the community of Chatham-Kent. Please drop by and see us at 131 Park Ave East, Chatham, to speak with our knowledgeable and experienced staff members for all of your battery needs! Wow hard to believe its 5 years since Paul and Kristie joined the fold! One of the best, and friendliest family-run businesses in town – no – anywhere!